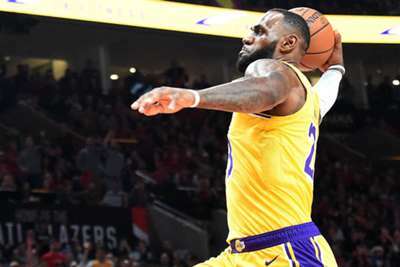 LeBron James' debut with the Lakers started well, but Los Angeles looked overmatched in a 128-119 loss to the Trail Blazers in Portland. James scored his first points as a Laker in dramatic fashion less than three minutes into the game, stealing the ball near midcourt and driving in for a thunderous dunk. James added another poster-worthy dunk 19 seconds later, and even the Trail Blazers fans in Portland's Moda Center reacted in awe at the back-to-back slams. While the Lakers built an early lead, they missed their first 15 three-point attempts and struggled to find rhythm on offense as coach Luke Walton shuffled the lineup around looking for chemistry. James scored 26 points (nine-of-16 from the field) and added 12 rebounds and six assists. As always, he was active on the court in directing traffic and he even shared an inspirational message with his new team-mates that was caught by the TNT camera: "Any time ya'll fall, stay down. Your brother will come pick you up." After the Lakers' shaky opener, James might have quite a bit of picking up to do with his team-mates this season. While all the focus and hype surrounding this game dealt with James and the Lakers, do not overlook the great job Portland did. The Trail Blazers have now won 18 straight home openers, and beaten the Lakers 16 straight times. The Blazers' All-Star backcourt of Damian Lillard (28 points) and CJ McCollum (21 points) performed as expected, but they got a huge assist from Nik Stauskas, who added 24 points off the bench. Joel Embiid scored 30 and had 12 rebounds and four blocks in the Philadelphia 76ers' 127-108 win over the Chicago Bulls. Ben Simmons notched a triple-double (13 points and rebounds, 11 assists) against the Bulls. Washington Wizards guard John Wall scored 26 points and dished out nine assists against the Miami Heat. Heat guard Goran Dragic hit only three of his 18 shots, although he did have eight assists and six rebounds. Wall slashed and jammed for the Wizards. Simmons hustled and dished for a beautiful assist. The Celtics are heavy favourites to win the Eastern Conference, and many observers expect the Raptors to finish near the top. Both teams have a new look, as the Celtics welcome back a healthy Kyrie Irving and Gordon Hayward, and the Raptors adjust to the addition of Kawhi Leonard and the loss of long-time star DeMar DeRozan.